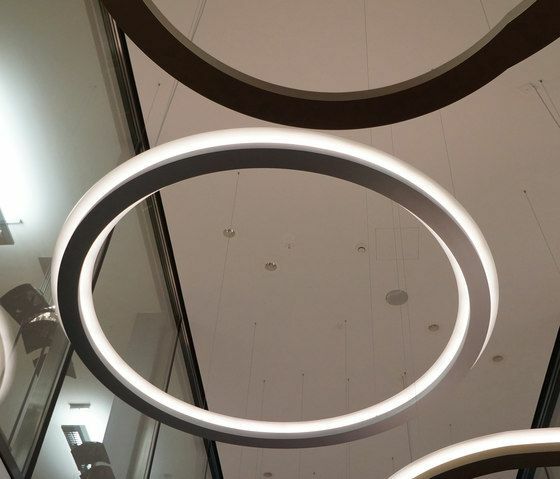 Chandelier 1800 SK, a special version of our 1800, brushed aluminum, coated, diameter 1800 mm, LED with total capacity of 36000 lm, 3000K, indirect light through the diffuser, 40% of the light scattered directly. The chandelier is also available in other diameters and special colors. The entire components, LED and driver, are located in the chandelier. Thereby the chandeliers compact design ensures ease of installation and maintenance.